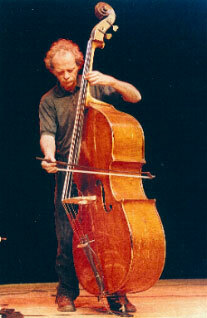 Born in USA, June 1939; contrabass, composer. Kent Carter's father was a viola player and conductor and his son studied piano, cello and bassoon as a child, starting with the bass in 1959. He studied music in Boston, Mass. from 1960 to 1964, participating in the "October Revolution" (a creative music movement in New York in early 60's) as well as performing and recording with the "Jazz Composers Guild Orchestra under the direction of Michael Mantler and Carla Bley. From 1964 Kent Carter toured and recorded in Europe with Paul Bley, Carla Bley, Michael Mantler, Steve Lacy, Don Cherry, Gato Barbieri, Alan Silva, Mal Waldron, Michael Smith, Bobby Bradford, Max Roach, Enrico Rava, Roswell Rudd, Derek Bailey, John Stevens, Trevor Watts, Steve McCall and many others. He was a member of the Steve Lacy Quintet from 1970-81 in Paris and a member and co-founder of the trio TOK with Takashi Kako and Oliver Johnson, touring Europe and Japan with extensive recordings on TRIO records in Japan and ECM in Europe. He started the Kent Carter String Trio with Carlos Zingaro, violin and Francois Dreno - viola and undertook tours and radio concerts in France and Germany. A CD recording The Willisau Suites was recorded in the 80's. Moving to the South West of France in the 1980s, he taught at the Beaux Art School in Angouleme for 6 years and during this period also toured with The Magic Circus theater co. performing Stravinsky's History of a Soldier throughout the south of Europe. He played with the trio Detail with the late John Stevens on drums and Frode Gjerstad, tenor sax with concerts and festivals in Norway and England. Recordings -included Less is more with Billy Bang on violin. Theo Jorgensmann Workshop Sextet: Charlie Mariano, Petras Vysaiauskas, Theo Jorgensmann, Karl Berger, Klaus Kugel. Petras Vysaiauskas Group: Oliver Lake, Karl Berger, Klaus Kugel. Voyage: trio with singer Beñat Achiary and David Holmes, percussion. 1965/66,	Touching,	Black Lion BLCD 760195. Paul Bley. 1965-1972,	Free for a minute 1965-1972,	Emanem 5210. Steve Lacy. 1968,	Communications,	JCOA 841124-2. Jazz Composers Orchestra. 1971,	Wordless,	Futura Records FUT 2020. Steve Lacy. 1972,	Cinco minutos de jazz,	Strauss ST 1087. Steve Lacy. 1972,	The gap,	Universal 067 861-2/America #09. Steve Lacy. 1973,	Weal & woe,	Emanem 4004. Steve Lacy. 1973,	Saxophone special +,	Emanem 4024. Steve Lacy. 1973,	Fairly early with postscripts,	Emanem 4027. Derek Bailey: two brief trios of Bailey/Stevens/Carter. 1973/74,	Quintessence,	Emanem 4217. Spontaneous Music Ensemble. Re-issue of Emanem 4015 and 4016 as double CD package. 1973,	Quintessence 1,	Emanem 4015. Spontaneous Music Ensemble. 1973,	Quintessence 2,	Emanem 4016. Spontaneous Music Ensemble. 1973,	Love's dream,	Emanem 4096. Bobby Bradford. 1974,	Scraps,	Saravah LP 10049/SHL 2082. Steve Lacy. 1974-5 Beauvais Cathedral,	Emanem 3306/Emanem 4061. 1975,	Esteem,	Atavistic Unheard Music Series UMS/ALP260CD. Steve Lacy Quinetet. 1975,	Dreams,	Saravah LP 10058/SHL 2082. Steve Lacy. 1975,	Berlin concert,	FMP SAJ-07. Noah Howard. 1975-6 Solo,	Sun SR 106. With Claude Bernard. 1976,	Trio live,	Ictus Rdc 5027. Trio with Steve Lacy/Andrea Centazzo. 1976,	In concert,	Ictus 123. Trio with Steve Lacy/Andrea Centazzo. Part of the Ictus Records 30th anniversary collection. 1976,	Trickles,	Black Saint 120008. Steve Lacy. 1976,	Austin stream,	FMP SAJ-09. Michael Smith Quartet. 1977,	The owl,	Saravah LP 10088/SHL 2082. Steve Lacy. 1977,	Follies,	FMP SAJ-18. Steve Lacy Quintet. 1977,	In Berlin,	FMP CD 138. Steve Lacy Quintet. Part re-issue of Follies. 1978-9 It will come,	Le Chant du Monde LDX 74686. 1979,	Troubles,	Black Saint 120035. Steve Lacy. 1979,	The way,	hat ART CD 2-6154/hatOLOGY 2-704. Steve Lacy Five. 1982,	Regeneration,	Soul Note SN 121054. Rudd/Lacy/Mengelberg/Carter/Bennink. 1984,	The Willisau suites,	ITM Pacific 970077. Kent Carter String Trio. 1984/1997,	The Willisau suites,	Emanem 4105. Kent Carter String Trio(s). 1980s-1990s,	Studio works vol II,	MAD Records 008. 1990,	Less more,	Circulasione Totale CT CD 909089. Detail. 1992,	One time,	Incus CD 22. John Stevens/Kent Carter/Derek Bailey. 1993,	Le vivre,	Minuit Regards LH 27292. Nelly Pouget. 1993-2000,	Studio works,	MAD Records 004. 1994-2006,	Snapshots,	MAD Records 007. 1994,	Duo music,	MAD Records 006. Jean Lapouge/Kent Carter. 1994/1995,	Last Detail - Live at the Cafe Sting	Cadence CJR 1068. 1996,	The Juillaguet collection,	Emanem 4033. Duo with Albrecht Maurer. 1997-1999,	Polyculturel,	MAD Records 003. Cinégraph's Trio. 1998,	Fellowship,	HatOLOGY 616. Theo Jörgensmann. 1998,	Madrlene,	MAD Records 009. Jean Lapouge Trio. 1999,	Duos & trios,	MAD Records 001. Jean Luc Petit/Frédéric Filiatre/Kent Carter. 1999,	Self portraits,	MAD Records 005. Original Emotion Picture Trio. 2002,	Jean Lapouge Trio,	MAD Records. 2004/05,	Intersections,	Emanem 4130. Kent Carter String Trio. 2005,	Opera kit,	MAD Records. 2009,	Summer works 2009,	Emanem 5301. Rivière Composers' Pool. 2010,	Oratorios and songs,	Emanem 5042. Kent Carter/The Rivière Ensemble. 2012,	Plaything,	NoBusiness Records NBLP 77. Gianni Lenoci/Kent Carter/Bill Elgart.